For strong, healthy-looking hair, take a permanent vacation from the stripping chemicals and damaging sulfates in ordinary conditioners. 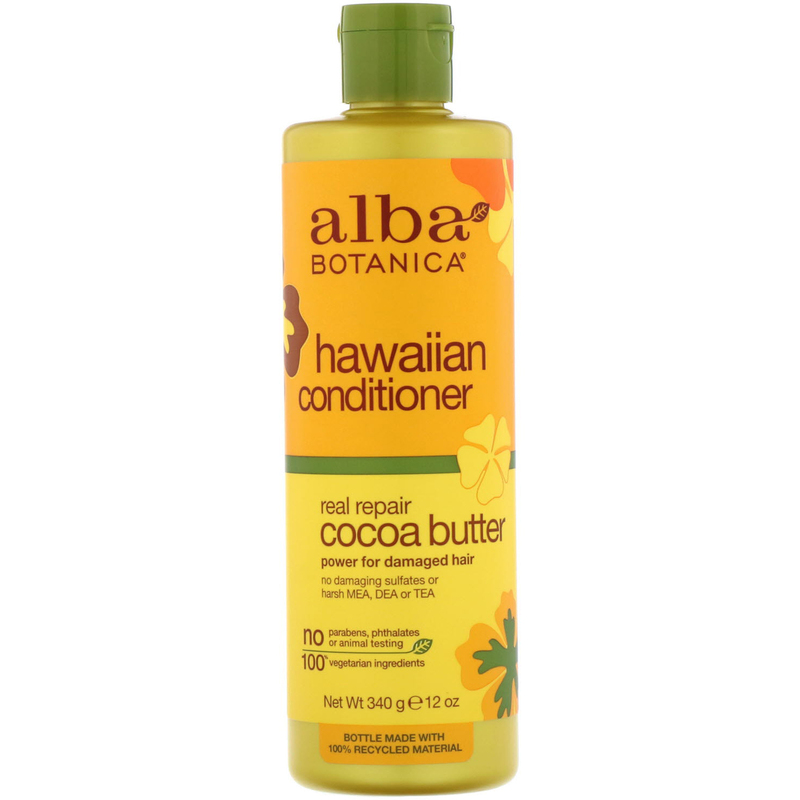 Instead, discover Alba Botanical Real Repair Cocoa Butter Conditioner, a powerful elixir for weak, brittle hair. 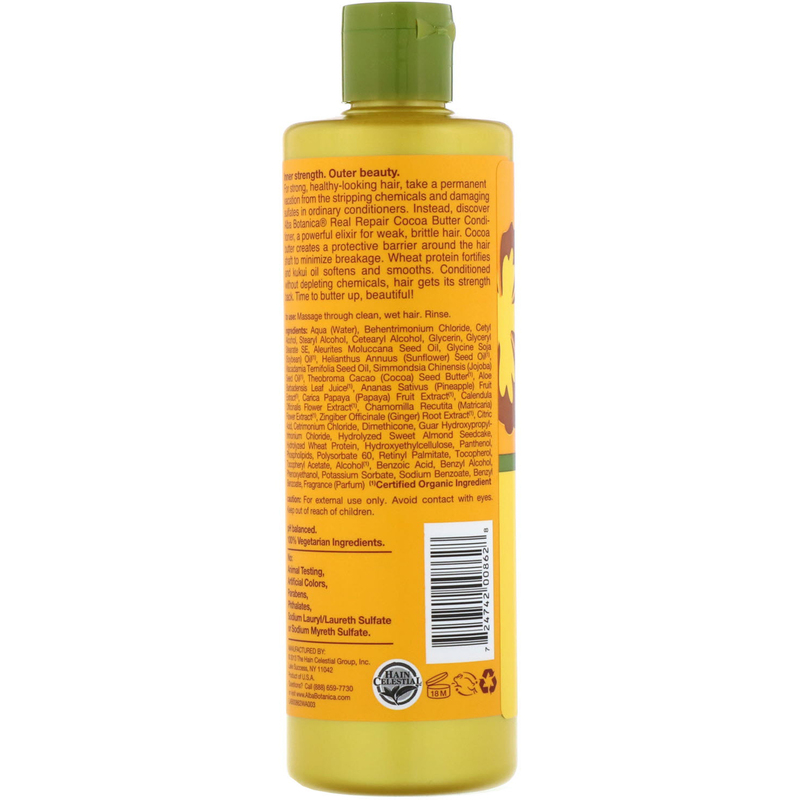 Cocoa butter creates a protective barrier around the hair shaft to minimize breakage. Wheat protein fortifies and kukui oil softens and smooths. Conditioned without depleting chemicals, hair gets its strength back. Time to butter up, beautiful! Aqua (water), behentrimonium chloride, cetyl alcohol, stearyl alcohol, cetearyl alcohol, glycerin, glyceryl stearate SE, aleurites moluccana seed oil, glycine soja (soybean) oil¹, helianthus annuus (sunflower) seed oil¹, macadamia ternifolia seed oil, simmondsia chinensis (jojoba) seed oil¹, theobroma cacao (cocoa) seed butter¹, aloe barbadensis leaf juice¹, ananas sativus (pineapple) fruit extract¹, carica papaya (papaya) fruit extract¹, calendula officinalis flower extract¹, chamomilla recutita (matricaria) flower extract¹, zingiber officinale (ginger) root extract¹, citric acid, cetrimonium chloride, dimethicone, guar hydroxypropyltrimonium chloride, hydrolyzed sweet almond seedcake, hydrolyzed wheat protein, hydroxyethylcellulose, panthenol, phospholipids, polysorbate 60, retinyl palmitate, tocopherol, tocopheryl acetate, alcohol¹, benzoic acid, benzyl alcohol, phenoxyethanol, potassium sorbate, sodium benzoate, benzyl benzoate, fragrance (parfum). No: Artificial colors, parabens, phthalates, sodium lauryl/laureth sulfate or sodium methyl sulfate.